Each new year brings new technology to evaluate for hunters. Dozens of hunting outfitters release hundreds of trail camera models. 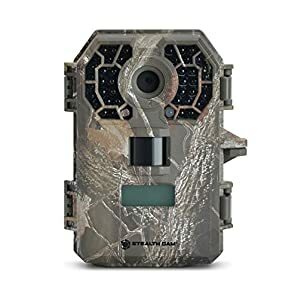 This can make it difficult to sift through the muck and find the best trail cameras that will provide you with good value for your time and money. So we decided to take it upon ourselves to do some of the legwork for you. If you are planning to purchase a new trail camera, you need to find the device that will suit your preferences the best. Some cameras are more user-friendly and will allow you to start photographing right away, and others require more knowledge to use but will offer better photos and more options. Since there are so many brands to choose from, you may feel overwhelmed without prior knowledge of how to distinguish between them. Having the most effective trail camera is essential for preparing for hunting season. A trail camera is a remote camera used to photograph game for hunting. It is made to capture photos without human interference. In some instances, a trail camera may be used in areas where the hunter cannot reach. Also known as a game camera, a trail camera uses a motion sensor to detect the movement of large animals. When an animal is detected, the camera will take its picture. Many trail cams snap photos only, but there are also hunting video cameras. The purpose of game camera pictures or videos is to show hunters where their game is located. Figuring out the frequent trails and patterns of these animals helps hunters determine the best areas to place tree-stands or blinds. Advanced game cameras are digital models that can store images on a memory card. The best of these have wireless functionality that allows them to upload the images to the Internet. Even without the frills, the best trail camera is one that is made to withstand the environmental components of the outdoors. It should be able to avoid damage due to heat, wind or water. Below you’ll find the top-rated trail camera reviews. We talk specifications, features, benefits and even disadvantages of each model. We’ll also explain how you can use this information to choose the best trail camera for you. Enjoy! This camera really can’t let you down with a host of great specs all delivered in a refined package. 10 MP clarity is going to deliver great performance and sharpness in photo quality. Want to save room on the SD card? Select 10, 8, 4, or 2 MP photo settings to find the right balance of quality and storage size. Video can be adjusted between 720p and 480p resolutions which will go a long way toward saving space or maximizing quality on your video clips. Settings can be adjusted up to 180 seconds per video clip so you can get a full video of the game’s behavior around your camera. 42 LED IR bank provides shots “up to 100ft” and as always we’re a bit skeptical about the claim. It’s definitely one of the biggest IR flash cameras on the market right now, though. If any camera is going to get a long-distance shot, this would be one of them. Setup menus are a breeze and settings are robust yet intuitive for quick and powerful configuration. Time-lapse, burst, video, and photo modes all have individual adjustments so you’ll get exactly what you’re looking for. Want some excellent 720p video with audio on your game scouting locations? This camera can deliver that, plus a ton more. Backlit display and controls for early morning or late night setup and photo retrieval make the process easy. Picture info will tell you everything you want to know about your game’s behavior – time, date, moon, temp, and camera ID all help keep your data organized. Use up to 32GB SD cards for storage and power up with 6 AA batteries to bring this beast to life. Fully adjustable picture and video resolution give you complete control over the quality and storage space on your trail camera. Other features include burst mode, time delay control, time-lapse mode, and IR trigger. For night video, you’ll only get a max of 20 seconds which is a bit low, but it should give you all the info you really need to study your game behavior and movements. Daytime video will continue to record for as long as the detected animal is in front of the camera. This is a feature we really love and recommend for great scouting while keeping as much space on the SD card free as is possible. Possibly one of the most technically advanced game cameras on the market right now, the 180i is named for its ability to shoot 180-degree field of view photos and video. Utilizing three fish-eye lenses, this camera is ready to capture a wide angle shot of all the action around your bait, stand, or trail. With a bank of invisible nighttime IR LED flash lights that’s impressive even by the most extreme examples of modern trail cameras, you’ll have tons of clarity on this camera. 50-foot detection range is pretty solid considering the 180-degree field of view is going to capture a huge view of the forest at a single glance. High-resolution images up to 4224×2376 pixels can be adjusted to achieve your desired level of quality. With the ability to accept a 32GB SD card and 12 AA batteries, this camera will prove to be a resource hog but sometimes we demand the best and won’t settle for any less. Python lock compatibility is a great feature on the expensive camera to keep the neighbors from walking off with your hard-earned technology. Gen 2 brings some much-needed upgrades to camera features on this trail cam. Improved lens and IR filter combined with a brand new rugged plastic housing bring the camera up to par with competitors. Other much-needed features include 10MP photo quality, widescreen aspect ratio, and invisible IR flash range up to 70ft pair well with a 50ft detection range. Color LCD viewing screen means you can view, manage, and edit photos right on the trail camera. This is a great feature for someone looking to keep things simple without having to transport cameras, SD cards, or computers back and forth. Quick start menu settings can make your setup painless, yet deep custom settings allow the robust use of the camera for your exact needs when wanted. Trigger speed is compatible with industry standards under one second and the delay reset can be brought down as low as 5 seconds. Pair that with upgraded IR capability, and multi-shot burst mode for a full spectrum of features. Don’t forget to adjust your photo resolution to your needs to maximize storage space and quality. On the highest settings, you’ll even notice more vibrant and clear colors than on previous models thanks to the Gen 2 upgrades. Plug in the 6 AA batteries and take this powerful Browning camera for a test drive. With 100 ft flash range we’re confident you’ll find great night time quality from the invisible IR flash LEDs in this camera. 10 MP image quality is standard and quickly becoming outdated, but that won’t really hold this camera back in the least. HD video is available with sound thanks to a built-in microphone in this camera. Super-fast trigger speeds of just above half a second make the camera lightning fast at recognizing and capturing images and videos. One great, and unique feature is the zero-blur night time image capture. Browning is known for superb or excellent industry customer support so you can be certain that a Browning camera will work flawlessly for a long time. Any issues will be quickly addressed and reversed by customer care. Without a doubt, this camera is near the top of the line for value and performance equilibrium. We like that the detection circuit is finely tuned and responds instantly to movement on the screen. The only possible drawback is that false positives may be an issue as the IR detects movements. Truly an innovation here, the name does not lie! As you might have guessed, this camera is capable of 360-degree field of view photos and video. Why would anyone need 360-degree photo capability? It’s perfect for food plot monitoring! The included t-post mounting bracket allows free-standing setup and use within your food plot so you can get a full sense of what’s going on at all times. Operating off of 8 AA batteries and a 32GB SD card, this camera will stand alone for weeks until you return to monitor your game behavior. 12 MP photo quality, 720p video, and 70 ft. IR detection flash range make this unique camera not only revolutionary but cutting edge by today’s tech. One of the biggest drawbacks is that the camera and flash unit rotate in order to take the picture. This presents two major problems. First, the animals tend to notice the movement and sound though it’s quite subtle. Second, the rotation means that there’s a longer than usual delay in photo and video capture as the camera works to capture the entire scene around its self. 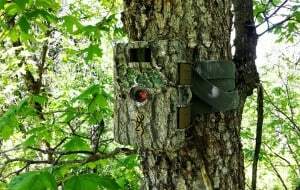 This camera might be ideal for a food plot, but avoid it for use on trees. Advanced features might be an understatement to describe the capacity of this camera. Hyper quick trigger speeds of .2 seconds put many competitors to shame. This is incredibly fast when compared to most competitors and we’re extremely pleased with the specs. Full HD video at 1080p quality is, again, above and beyond many competitors with most others offering 720p video at most. Record up to 60 seconds of video at a time in full HD. One huge bank of 48 invisible IR LEDs illuminate night photos and the detection sensor is adjustable to prevent false positives. Use the time lapse field scan mode to monitor your location at set intervals and set up the camera to record date/time, temp, moon, and GPS data. 14MP photo quality is absolutely top notch and will result in clear, sharp, and easily visible game on your recordings. With an 80-foot flash range, you’ll be able to get crisp and sharp details all the way out to the edge of your hunting and scouting range. 1-second photo recovery time will be ideal for getting every angle when you’ve got that big buck in front of the camera. If you’re looking for the absolute highest density of pixels in your trail camera photos, this one might take the cake. With the capacity to capture 20MP photos, this trail camera will quickly eat up SD card storage space with huge file sizes. Capture delay of only 0.25 seconds is amazingly fast and, paired with high image resolution, will result in some of the best possible photos. With an invisible flash range of up to 100 feet for night shooting, you’ll be able to put the powerful camera lens and sensor to good use even in the darkest conditions. Be sneaky with your setup on this camera as you’ll find that animals seem to notice the flash and image capture a little more than many competing models. You’ll want to disguise your camera well! One of the biggest drawbacks is that the camera is very power hungry and we advise users to be prepared to go through a lot of batteries when operating a Cuddeback camera. If you’re willing to feed the beast batteries, then you’ll find the photos crisp and sharp at long range. Another quick trigger speed camera with adjustable resolution sensor, the G30 can be a great solution. Half a second trigger speed is used to shoot photos in either 2, 4, or 8 MP resolution. Pair that with a 32GB SD card and you should have enough storage space for tons of photos. 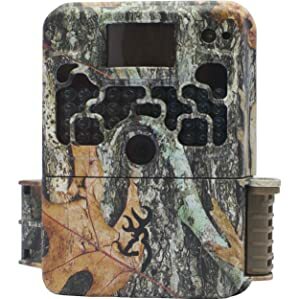 Backlit menu and fully functional programming give you control of all the features on this trail camera, including HD video recording of up to a minute and a half. 30 infrared LEDs emit enough invisible light to shoot night photos out to 80 feet. Motion reduction technology helps to stabilize and reduce blur on moving shots, especially helpful at night. Burst photo mode can capture up to 9 images in a series and photos can be tagged with GPS geotagging to record locations permanently. One cool feature is that the time-lapse photo mode can be programmed to override the default when the camera senses motion. That means you can shoot time-lapse photos without the fear of missing any action if your game passes by the camera in between prescribed photo times. Advanced low light sensitivity modes mean improved dusk and dawn image capture ability. With an onboard 12MP camera, the pictures from this camera are going to turn out sharp. 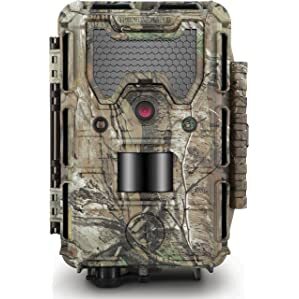 Pair that with 1080p video recording with onboard audio and you’ve got a well-rounded trail camera that can find a place anywhere in your arsenal. Toss in the optional 32GB SD card to make sure you’ve got plenty of space to record images and photos. Program the video to record in 5-90 second intervals and photo burst mode to shoot 1-9 photos per trigger. Other modes include camera or video, camera + video, and time-lapse. 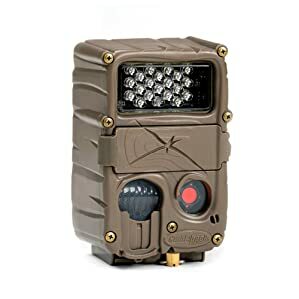 36 LED IR flash means shots up to 75 feet in night conditions with clarity powered by 8 AA batteries that can chew up an astounding 40,000 pictures at a time. Photos can be tagged with barometric pressure, GPS, moon, temperature, time, date, and camera ID when needed. Barometric pressure is a nice tag to include that’s often overlooked as you’ll get a much better sense of your game’s behaviors during certain weather conditions. With a trigger time of .6 seconds and reset as low as 1 second, you’ll not miss a piece of the action when there’s a lot going on around the bait pile. Last but not least is one of the highest resolution camera sensor models we’ve reviewed. This KV.D game camera sports a hefty 16 MP sensor on the integrated camera. Paired with a row of 42 IR LEDs you’re certain to find high quality, crisp photos at just about any distance. Trigger speed of half a second on smaller SD cards is lightning quick. Motion sensor optimization technology means you’ll have fewer triggers caused by leaves, grass, and trees when moving. With a compatible 64GB card and 8 AA batteries, you’ll be able to shoot photos and video for weeks in high definition without needing to clear the memory. 2.4” color viewing screen is built into the waterproof housing of the camera to allow viewing and managing of photos without even removing the SD card or taking the camera off of the tree. Lock important images and set the game camera to continue shooting photos and video in loop mode to erase older photos and videos with newer ones. All great features for the outdoor person looking for maximum quality and flexibility with minimal maintenance or hassle. Which of These Trail Cameras Should I Choose? For Best Overall go with the ** TOP PICK ** Stealth Cam G42 No-Glo. Remember to thoroughly consider your needs before purchasing a trail camera as each type can be more or less beneficial for your needs. Using our list you’ll be able to find the game camera which best suits your needs for wildlife management, hunting, or general surveillance. Every trail camera is designed with different goals in mind. When evaluating and comparing game cameras, consider each of the following points carefully in relation to your reason for wanting a camera in the first place. The design of a trail camera is important due to two factors: concealment purposes and durability. 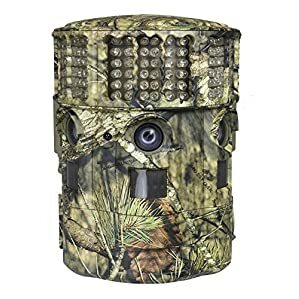 A trail camera that is compact and covered in a camouflage tone (possibly with a bark-like texture) makes it easier to hide from potential thieves, as well as animals like bears that are known to destroy such devices. 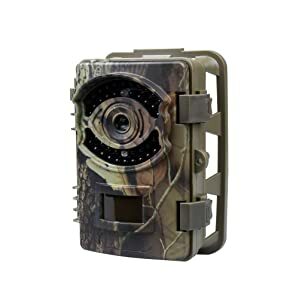 If your trail camera is made of a durable material and is rated to withstand extreme weather conditions, you will get more life out of it than a cheap, flimsy camera that could be destroyed by a single drop of water. The more megapixels a game camera has the clearer your pictures will be. Remember how blurry images were when cell phones with cameras first went on the market? Those were largely one and two megapixel cameras. 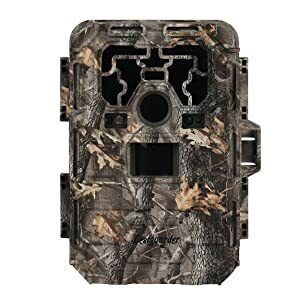 Today’s modern trail cameras are rated as high as 14 megapixels, and you can also adjust the pixilation to save battery life if picture clarity isn’t a top priority. High-definition video resolution is especially important for hunters who want to keep an eye on the movements and habits of specific targets. Trail cameras that have video recording capabilities come with everything from 240P to 1080P resolutions. When considering your video recording needs, also pay attention to the length of the videos that your camera is capable of recording. Some models max out at 15 seconds while others can record for as long as 2 minutes and there are sometimes differences between daytime and nighttime recording lengths. Night vision technology has made tremendous advancements in recent years. When it comes to scouting, tracking, and home surveillance, night vision is a necessity. There are three basic types of flashes when it comes to trail cameras. An incandescent flash is a type used by standard cameras (the “white” flash). While functional for the purpose of snapping a photo, an incandescent flash is extremely obvious and will likely scare targets away from the area. Cameras with an incandescent flash are usually less expensive because they alert whatever triggered the camera to its existence and location. However, they also tend to have slower trigger and recovery speeds. Additionally, incandescent flash bulbs draw more battery power than infrared and covert LED bulbs. Incandescent flash trail cameras can take full-color photos during the day that turn out extremely well, and as of 2017 incandescent or “white” LEDs are the only ones that will result in full-color photos/videos at night. Infrared flash trail cameras have LEDs that emit a reddish glow at nighttime. You might have seen infrared LED bulbs on security cameras in an office or at the convenience store. This kind of flash is useful for aiding in motion and heat detection and it makes photos taken at night clearer. While more subtle than an incandescent flash, animals and/or intruders can still notice the infrared flash if they are looking in the general direction of the camera itself. Infrared LEDs use substantially less battery power than incandescent bulbs, but nighttime photos may be somewhat grainy. Trail cameras with standard infrared LEDs can only capture photos and videos in black and white at nighttime. The most advanced type of flash technology available today for trail cameras goes by many names, including ghost, black, and no-glow. Each of these terms is used by various trail camera manufacturers to describe illuminators that appear to emit no light whatsoever. The light waves produced by covert trail cameras are very effective at illuminating targets and they are virtually undetectable to even the most cautious animals. Trail cameras like the Bushnell 14MP Trophy Cam HD Aggressor and the Stealth Cam G42 No-Glo are especially advanced in this area. Such models have flash technology that uses slightly more battery power than a camera with an infrared flash, but no-glow flash photos are of the highest quality. Black flash trail cameras are the easiest to conceal and the most difficult to detect. Serious hunters who are willing to pay for the latest technology will likely opt for game cameras that use no-glow LEDs because they provide great results, thanks to the camera quality, lighting quality, and trigger speed. Photos and videos recorded at night will be in black and white but they tend to be exceptionally clear. Range – A camera’s range will determine how close movement needs to happen for the camera to detect it and snap a photo or record a video. A minimum range of 30-40 feet is preferable, and some game cameras can detect movement from up to 100 feet away. Knowing where you plan to deploy your camera is crucial when figuring out how much of a range you’ll need. Field of Vision – A trail camera that can detect movement 100 feet away is useless if it can only see things that pass directly to the front. 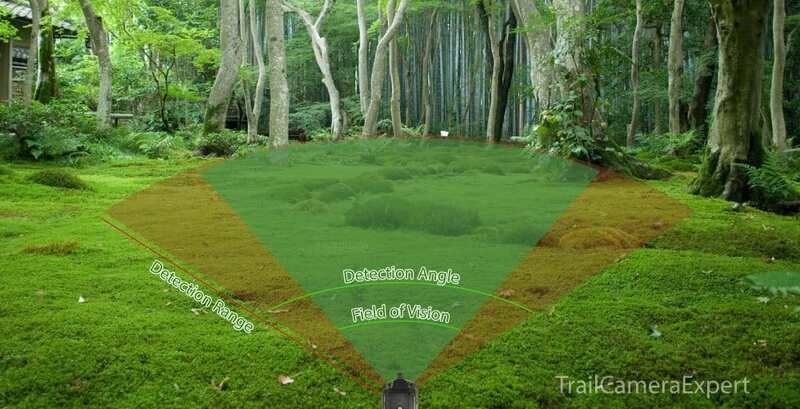 The field of vision rating of game cameras tells you how wide of an angle the camera has. 40-50 degrees is standard, and some cameras have up to a 100-degree field of vision. A couple of cameras are even designed with a 360-degree field of vision (see the Wildgame Innovations 360 trail camera review above). Trigger speed is defined as the amount of time between when the camera detects movement and when it snaps the photo/starts the video. The higher the trigger speed, the higher the chance that you’ll catch only the back end of your target (or miss it altogether). 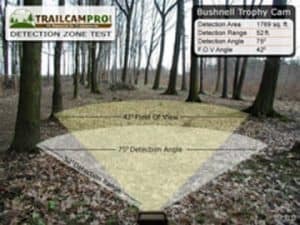 The Stealth Cam G30 Triad Armed trail camera and the Bushnell 14MP Trophy Cam HD Aggressor have two of the fastest trigger speeds at 0.5 and 0.2 seconds, respectively. Recovery speed is the time a trail camera needs to capture and save a photo before being primed to take another photo. If you want to track multiple targets in a group or observe the general movement of a target then you’ll want a recovery speed of five seconds or less, and many game cameras boast recovery speeds of less than three seconds. Trail cameras use something called an SD (memory) card to store images and videos. The amount of data that can be stored is directly related to the megabyte rating of the card. SD cards of up to 64 megabytes are available, but some game cameras only support cards of up to 8 megabytes. Knowing how many photos or videos you expect to capture, as well as knowing how often you plan to retrieve the stored data, is important when considering the SD card rating of game cameras. Some cameras use wireless technology to transmit photos and videos directly to your phone or computer. Many models also have an overwrite feature that erases the oldest photo/video with the newest when the memory card is full. A lot of trail cameras use between 4 and 12 batteries (usually AA). Others use C batteries. Lithium batteries are usually preferable over alkaline batteries, but check the owner’s manual to verify if that’s true for your trail camera. Many cameras give you the option of using either 4 or 8 batteries at a time, and by choosing the option of 8 you get roughly twice the battery life from the device. Compare the expected battery life of cameras you’re considering and think about how often you expect to visit the camera’s location to replace the batteries. We recommend bringing a battery tester with you so you can check the battery life each time you go to check your trail camera. External Power – Many models offer you the option to plug in an external power source, such as a 9 or 12-volt battery. This is a popular option for users who plan to deploy the camera in an area that’s protected from the elements, such as in a garage or under an overhang. Solar Power Panels – Many of today’s game cameras allow solar power plug-ins. 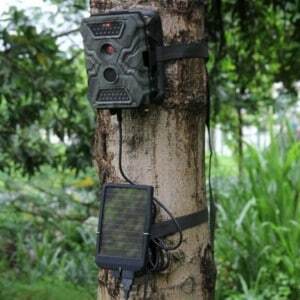 If you elect for a solar-powered trail camera, you can place the device outside without having to worry about having electricity service nearby. It’s important when hooking up and mounting a trail camera that runs on solar power to make sure that the solar panels have regular access to direct sunlight. Otherwise, the camera could die on you and leave you unable to capture photos or videos. If multiple power options are required, consider the Bushnell 14MP Trophy Cam HD Aggressor because it works with internal batteries, exterior power sources and it is solar panel –compatible. Many cameras have multiple modes (e.g. camera, video, time lapse, rapid fire, etc.). Other common options include LCD screens that display information like the time, date, temperature, GPS coordinates and moon phase, and that data can be stamped onto each photo or video. Some cameras offer an audio recording capability, which many hunters find useful when packing decoys and calls. Many trail cameras allow you to save configurations to make it easier to revert to certain settings, and some wireless game cameras allow you to adjust the settings remotely. Knowing which modes and options will best serve your needs will help you determine the best trail camera for you. It may not be possible to remove the SD card from your trail camera and see the results using just a standard digital camera. This is why many hunters buy trail camera viewers. There is, however, another option. Some trail cameras have built-in viewers so you can look at pictures and videos on-site. The biggest benefit of a trail camera viewer or built-in viewer is that you don’t have to go all the way home to see what’s been activating your trail camera. What’s in a name? 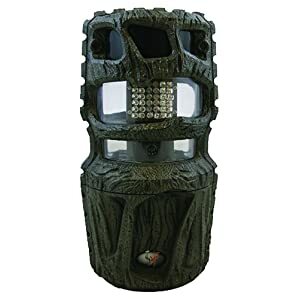 Most trail camera makers have produced some models that received favorable reviews as well as a few that were universally mocked. It’s always a good idea to consider the game camera maker, though, because it can tell you a lot about the reputability of the company, the warranties it offers, and you can easily find out what hunters like you have to say about their experiences with a particular company’s trail cameras. Most trail cameras offer a resolution of 2 to 12 megapixels. The clarity of the photo is dependent upon the camera’s resolution. The best trail cameras in overall quality have the highest resolutions. The contrast of the photo is also important. The more contrast between the colors the camera picks up, the more you will be able to distinguish game from their surroundings. A vibrant color quality provides richer detail. The detection circuit of a game camera is the mechanism that works to detect the animals’ heat and motion. It consists of the trigger speed, recovery time and the detection zone. 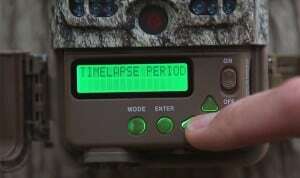 Most trail cameras offer a battery life of six months to a year. A longer battery life means the camera can be left for longer periods of time before needing to check it. Battery sizes may vary from AA to D, and lithium batteries provide the longest life. Rechargeable batteries prove to be more cost-effective over time. Trail cameras utilize either incandescent or infrared flash for photos. Infrared technology allows for capturing images of game at night. Infrared cameras allow photos to be taken discreetly without the sudden bright flash that may scare animals away with incandescent flash. The subsequent commotion may also compromise the details within the photo. It may also increase the chances of theft as it alerts other hunters to the camera’s location. Incandescent cameras are best suited for those that prefer images with more color and clarity. Trigger speed is a time measurement based on the time between the first detection of animal movement and the time the shutter is engaged. The trigger speed can make a huge difference in the detail captured in the image. Faster speeds are likely to capture more than one shot of the animal, but slower speeds may capture a single shot of the animal, one end of its body or the blur of the animal retreating. These speeds can vary from 0.1 to 5 seconds. The trail camera’s detection zone is the area before the camera that can detect motion or heat. Reconyx cameras have a wider detection zone and can detect movement immediately when an animal comes into view. The advantage of the field of view is spotting additional animals that may be in the background. The drawback of cameras with wide detection zones is the greater number of pictures that results in more battery usage and more storage space used. Cuddeback cameras are known for their narrower detection zones. In order for a picture to be taken, the animal must be directly in front of the camera. The benefit of this style is that animals are usually captured right in the middle of the photo. The downside to this is that animals farther from the camera will not be captured. The recovery time is the time it takes the camera to notice a trigger, respond by capturing the photo, store it and prepare for a new image. A faster recovery time provides more information about the entire scene of events as you see near-immediate images back-to-back. The way you plan to use the camera will determine the best recovery time. Trappers obviously have no need for repetitive images on an animal being lured into or caught in their trap. 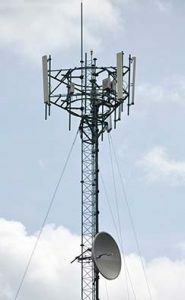 A cellular trail camera uses cell towers to transmit images via a cellular network similar to the way images are transmitted with a cell phone. These trail cameras provide the greatest flexibility because they can be used anywhere there is cellular service. 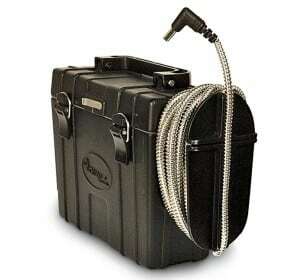 They can be placed anywhere, so they are ideal for remote areas. A wireless game camera can send data through Wi-Fi networks or through sophisticated radio transmission, but for shorter distances compared to cellular models. Information regarding the time a shot is taken can be critical to a hunter’s seasonal plans. Most high-quality cameras will have the ability to provide the time of day and the date corresponding to when each photo is taken. Most advanced models feature video functions. Videos may last from a few seconds to minutes in length. 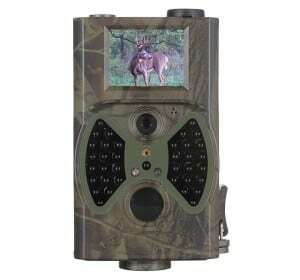 The best game cameras equipped with video offer HD quality, and some cameras even record with sound. The downside of this function is the fast consumption of battery life and the increased memory used compared to still images. This problem is made even worse for areas with high animal activity. The night range is the distance the flash is able to capture during night photos. Moonlight, clouds and other environmental conditions may affect its accuracy. Photos taken on a trail cam are usually stored on SD memory cards. Cards with higher capacity are more expensive, but they allow you to leave your camera in the wild for longer periods. Memory cards allow data to be transferred from the camera to a computer without having to move the camera from its position to connect it to the computer. While it may be overlooked compared to other features, the design of a game cam is one of its most important aspects. The best wildlife camera should be discreet enough that it blends in with surrounding scenery. It should also be resistant to the elements while remaining light and compact. Mounting the camera to a tree should be made simple by the design as well. Some cameras go so far as to include temperature, barometric pressure or moon phase into the information. Advanced models are GPS tagged. Your personal budget may be one of the leading factors in making the decision. As with most products, the more expensive models tend to offer the best features. Many hunters will not need advanced features, so these models may not be ideal. The best trail camera for the money is one that meets a hunter’s specific needs within a reasonable price range. We scoured the Internet to find out the most frequently-asked questions about trail cameras. As part of this comprehensive article about the best trail cameras in 2017 we’ve answered your questions below. If you have a game camera question that isn’t answered here, we encourage you to contact us directly so that we can help you and then add your question to this list. What Are the Best Trail Camera Brands? 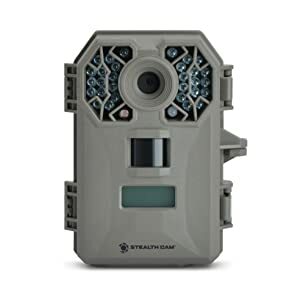 Stealth Cam produces an assortment of popular scouting camera products and is committed to providing camera products with excellent image quality. Moultrie game cameras are some of the leaders in the industry. They offer a number of high-definition infrared cameras with vivid color. Many of their models include HD video capability as well as night vision photo capture. One of their most impressive is the Panoramic 150 with a 150-degree field of view. As one of the most recognized names in the hunting industry, Bushnell is known for creating a number of quality products, including cameras. They offer cameras with wireless capability, crisp night imagery and HD video recording with audio. Their signature Trophy Cam offers a lightning-fast trigger speed and exceptional battery life. Primos creates nearly every kind of product a hunter could need for a successful trip, and their game cameras are no exception. They produce various forms of their Truth Cam model, and it is as simple as it is affordable. They have improved features in their popular line and now offer reliable cameras with better picture quality. Reconyx is the producer of the HyperFire HC500, one of the most praised trail cameras on the market. The brand creates advanced level cameras that are known for image quality. Their trigger speeds are impeccable, making their detection circuits some of the best in the business. Many trail cameras are judged by the standards of the HC500 model. Wildgame Innovations offers affordable trail cameras that are easy to use even without much experience. They are often not as quick as models from more advanced brands, but they are comfortably reliable. The Pulse 10 model offers a range of 50 feet, and it is compatible with wireless equipment. These two terms are completely interchangeable. Both phrases refer to a device that is meant to detect and capture movement. You can use these devices for tracking, hunting, observation, surveying and to keep an eye on things at home or at your business. What Affects the Battery Life of My Trail Camera? The battery life of your trail camera depends on numerous factors. The more activity there is in an area will result in a shorter battery lifespan because the camera is frequently taking pictures and recording videos. Nighttime detection uses more battery juice because of the LED activation. Videos pull more battery power than photos, as do using settings like time-lapse mode and rapid fire mode. Many trail camera manufacturers install battery-saver technology to preserve the life of your batteries when there is no movement detected for an extended amount of time. 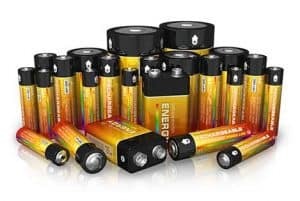 As a general rule, batteries should last between two and six months. How Important is SD Card Size in Relation to Trail Cameras? Trail cameras have different memory card allowances. Some can work with SD cards with 64-gigabyte capacity while others will only take 8-16GB chips. The memory capacity of your SD card determines how many photos and videos your camera can save. The quality of the photos and videos also affects that number. For example, a 5-megapixel camera with a 64-gigabyte SD card can save over 30,000 photos while a higher-quality 14-megapixel camera (also using a 64GB memory card) can store approximately 14,000 photos. There’s no real downside to larger SD card size, especially if you won’t be able to access your camera regularly. If you know you’ll be downloading photos from the camera often, then you might be able to save a few bucks on a game camera with a lower memory capacity. It’s also worth noting that some cameras have an “overwrite” feature that will save the newest photo and delete the oldest one when the memory card is full. Do Trail Cameras Work the Same During the Day as They Do at Night? Trail cameras work toward the same purpose 24/7 but the methods and results vary according to the lighting. 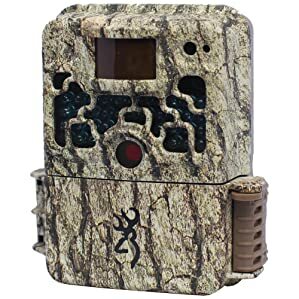 The best trail cameras usually take color photo and video during the day, but the infrared or covert LEDs only allow for black/white at nighttime. The detection range might be 10-20 feet shorter at night, and video recordings could also be shorter. The camera will probably use more power at night due to the LEDs, especially if targets in the area are nocturnal. Some models have a timer so you can arrange for the camera to go into sleep mode during certain times of the day or night. What’s the Best Way to Mount my Trail Camera? A lot of manufacturers include a mounting strap with the trail camera. You can use this strap to mount the camera on a tree. Mounting brackets suited for every purpose are available online and in hunting outfitters, or you can make your own. It’s best to mount the camera as securely as possible so it won’t move and cause you to lose your view. You might want to mount the camera in a lock box designed for trail cameras to prevent theft or damage. Feel free to conceal your camera however you like, but make sure the lens and LEDs remain unobstructed. What is the Difference between Standard, Wireless, and Cellular Game Cameras? A standard trail camera does not have Internet or cellular capabilities, although some can detect GPS coordinates automatically. Pictures and videos must be retrieved manually. A wireless game camera is able to connect to the Internet via Wi-Fi. It can send live updates, but the range is relatively short. A cellular trail camera uses networks like Verizon and AT&T to relay photos and videos to your phone or email wherever there is cellular service. There is a monthly fee of $5-$20 payable to the cell provider for this service. How Can I View Pictures/Videos in the Field? If you have a digital camera that has an SD card reader, this might be a viable option. For convenience, however, many hunters buy trail camera viewers that plug right into the camera itself. You can then save the images to the device and pop the newly-cleaned SD card back into the camera. To make things even easier on yourself, buy a trail camera with a built-in viewer. Can I just put my SD card into my digital camera to view pictures? The SD card may not display images properly when placed in a digital camera due to file compatibility issues. It is best to transfer files from the SD card to a computer for optimal viewing. How far away should I place my camera? Depending on the camera’s range, placing it about 30 feet away from a feed source, lure or trap should capture the best photos and video. This allows for image capture of game close to the source as well as those in the background. At what height should I place my camera? The camera height may depend on the type of animal you wish to hunt to get the best views. In most situations, a height of 3 to 5 feet should work well. What Should I Do If My Trail Camera isn’t Working or Providing Me with Pictures/Videos? First, use a pocket battery tester to make sure the batteries are fully-charged. If fully-charged batteries don’t do the trick then plug the camera into an external power source, if possible. The next step would be to contact the manufacturer so they can help you troubleshoot the problem. Keep receipts and warranty cards in a safe place in case you need to return or exchange a damaged game camera, and always find out how the manufacturer and/or vendor handles returns, repairs, etc. Being a successful hunter involves carefully tracking your game so as to avoid wasting time in unpopulated areas. If you want to improve your hunting skills, you need the right equipment to take control. A trail camera can provide the detailed information you need to accurately follow game over time. Every hunting experience is different, and every hunter has different needs. What works for one person may not be the solution for everyone else. To get the best out of your experience, find the right trail camera for your specific needs. 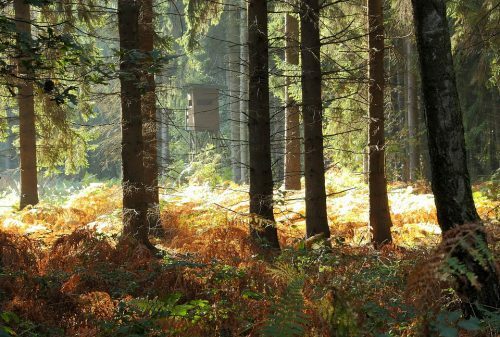 This will help you improve your hunting ability while also making it much more enjoyable. With an advanced camera, you can monitor your hunting area all year long. The information you collect can help you develop strategies to use throughout the season. The changes made to your hunting experience by adding a trail camera are too significant to make a poor decision. Using a camera without knowing what is compatible with your hunting style, game or habitat could prove to be just as tedious as constantly scouting the location on your own. Thank you for all of this great information. I have been in search of a new trail camera, but always seem to get only SOME of the information I would like to see before I buy. Here you did a great job! I really like your trail camera website. 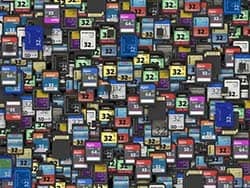 This is one of the only places that I was able to find price comparisons for all of the cameras that I have on my list. I need at least 20 of them to cover the 300 acres that I hunt and I do not want to get stuck with a dud of a camera. 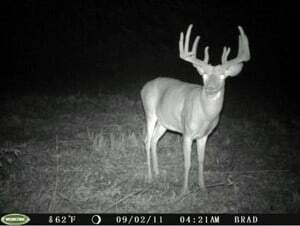 I would like to know if there is a trail camera that can view more than 100 feet in the dark? I have a wide open area that I want to see at night, but do not want to buy more than one camera. can you help? When it comes to getting a good trail camera that works for me, I love the ones that take AA batteries. Any camera that I have to put C’s or D’s into just does not last as long and I am not sure why that is. I use the BestGuarder and I love it! 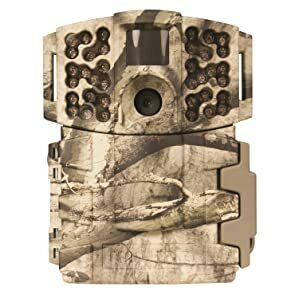 That is one of the best trail cameras that I have ever used out of the 10 that I have purchased my entire life. •	All tests were done in the HD mode of operation. The first observation I noted was that all test targets (me or my dog) were in the middle of the frame when pictures were taken, which indicates the narrow range of triggering. Based on what I see and what I’ve read on other reviewed cameras by WGI the trigger range is approximately 15 degrees. This is fairly narrow, if a deer was to walk by parallel to the 15 degree cone, it would never get captured. When the camera is set to Hi sensitivity and Hi exposure the “consistency” is good. As I walked by several times (day or night, left or right entry) the camera captured me at near the same spot each time. This is a double edged sword… if a deer walked by perpendicular or cross wind, it would capture the picture towards the center of the screen (good), but only if it passed the 15 degree cone. I guess what I’m saying is the ½ second trigger takes place only in the middle third of the frame when the subject is greater than 25 feet away, and does so consistently. The problem I have with this is not all my deer cooperate to the middle third of the cameras full view. While the video did work, I found it was cantankerous in triggering. Once triggered the video did fairly well. The Med exposure seemed to be the most consistent with night video; for some reason the Hi sense hi expose on nigh time video triggered after I had passed (way too slow) or triggered before I got in the frame (super sensitive). The LED disbursing of light was not uniform; rather it was centered in the middle third of the entire frame out to a distance of approximately 50 feet. After 50 feet the subject walking away faded exponentially. There was no microphone/sound associated with video. Overall, the feeling of this camera is “for limited use in picture mode only, with Hi sense and Hi exposure and placed on narrow points of interest (e.g. pointing down a trail, or a feeder). The major down side is the Hi sense/Hi exposure setting gives a little blurry nighttime picture (where the blur is amplified with distance), The upside to the Hi/Hi setting is it does do a better job capturing the target a longer way off. Daytime photos are OK. In Med exposure the photos at night were only marginally better. Under no circumstances should the Lo exposure setting be used; the Lo setting only resulted in photos of me 1 foot away as I went to turn the unit off. My main experience before this review is with various Moultrie’s (M-880 and M-990i). The Moultrie’s are a better camera overall; better pictures, better video’s (with sound), better sensitivity, and better light disbursal. They also contain more information on the info strip. But the price was too good to pass up on the WGI camera if it did what the box said it would do. It does not. My final grade is a “C-minus” for the I10B38D2. Great information on trail cameras all packed into one place. Thank you for the information and here are some trail camera placement tips that your readers are sure to enjoy. Thank Michael, it’s an useful guide! Study Elusive Species Using Trail Cameras!